We, Axcel gases along with our associated companies are a renowned Sulfur hexafloride gas manufacturer, supplier, dealers and exporters in India. Sulfur hexafluoride Gas is an inorganic, tasteless, odorless, colorless, nonflammable and green house gas and is a excellent electrical insulator gas. It has a boiling point of -64.0°C (-83.0°F). It is produced by elemental exposure of S8 ( Sulfur ) to F2 ( Flourine ) . It has got 6 Flourine atoms which are connected to a single Sulfur atom at the center. It is a liquefied gas and stored and transported in Sulfur Hexa Fluoride cylinders for any industrial/lab grade applications. Sulfur hexa floride gas is available mostly in its purest form. We have in house laboratory equipments to check the level of purity as well as various impurities present in it. Due to its non reactive nature most of the Sulfur Hexaflouride gas finds its huge application in electrical industry. 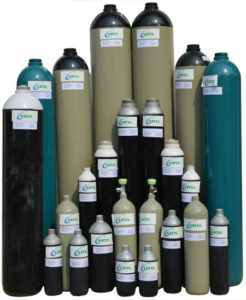 It can also be used as a mixture or calibration gas in various laboratories and research centers. Most of the SF6 is getting used In Electrical Industry as a gaseous di electric medium in circuit breakers and Insulated switch gears. In Insulated glazed window industry. In medical services like retina surgery. These are some of the common uses of Sulfur Hexa fluoride. There are various other ways in which SF6 can be used in a particular industry or process.